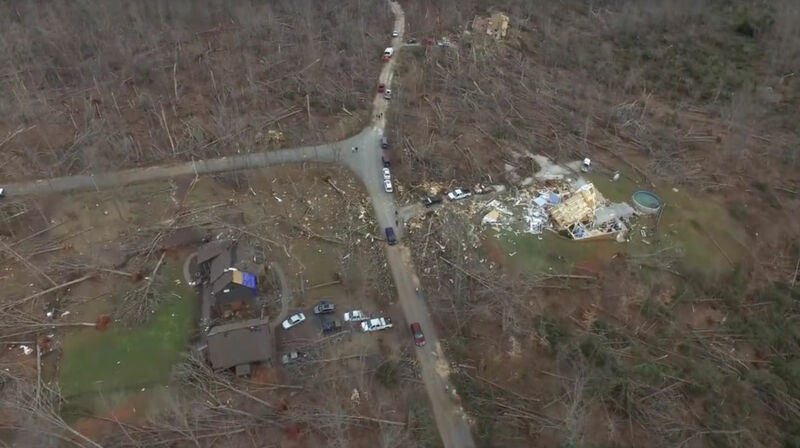 I just watched a drone video of the tornado aftermath that hit Appomattox and Evergreen, Virginia, on Wednesday, February 24, 2016. Absolutely unreal. My sister who lives in Appomattox said it looks like a war zone. Fifty families are without homes. Miraculously, only one death—though even one is too many. My aunt and uncle were affected. Their home (left in the picture above) was severely damaged but was still left standing. Their neighbor’s house (right) suffered a different fate and was turned into toothpicks and debris. Large trees on all sides lay flat as if God flicked them over with his finger. I read an article earlier that touched me: Dog dies in tornado after saving owner’s life. Some of the man’s belongings were found a county over. His dog was found under debris, sadly. The man was an army veteran. He was asleep when it began. His dog woke him. The man was flung 25 yards into a brick wall. He woke up to a home that looked like a bomb went off. Even though I live only a few hours away, I feel somewhat detached from the entire situation. It’s hard to grasp a reality such as what happened, even through pictures. The community has come together with an outpouring of support for one another, my sister said. She’s proud of where she lives. She should be. Severe damage. Entire stories of well-constructed houses destroyed; severe damage to large buildings such as shopping malls; trains overturned; trees debarked; heavy cars lifted off the ground and thrown; structures with weak foundations are badly damaged. The 2013 El Reno tornado in Oklahoma was the widest tornado in recorded history. It killed eight people and injured 151. As the Appomattox tornado was happening, I was in Charlottesville on the phone with my boss in Richmond. She grew up in Surry County, where another tornado touched down in Waverly killing three, including a 2-year-old child. Her uncle lost one of his friends. One minute he was here, the next minute he was gone. Tornadoes don’t happen here, except when they do. There are ways you can help, even if you can’t physically be at ground zero to volunteer. Food, supplies, clothing, financial assistance and donations. Go here (Appomattox) and here (Waverly). There are homeowner’s claims that will be filed in the days to come, and with claims there are deductibles. I have a sister, sister-in-law, two brothers-in-law, a nephew, two nieces, and two aunts and uncles that live in Appomattox. This could have been their homes. For my aunt and uncle, it was. Their lives. It wasn’t. But it was someone’s. Consider donating, even if it’s only a little. Jeff you would not have believed the destruction. I really didn’t believe the tornado warning. I thought it was a joke. When I called Donnie to tell him, he said I got the puppies in because it looks like it’s going to rain. I told him I’ve got to go back to work and hung up. The next time I called home the phone was dead. The painter from Amy’s house had called me at work and said come home right away. I redial end his cell numbers and ask if he had called me and was this a joke. He said No ! I couldn’t believe my eyes when I got there. Thank you. Jennifer and Gwen were such get help. Gary and butch were troopers too. Amazing family, friends and community. Appomattox is awesome. The Sothern Baptist Disaster Team has amazing group working. It’s unbelievable. I just saw a different photo of your neighbor’s house — a before and after. It’s a miracle the painter who called you and who was in that house made it out alive. I can’t imagine what it must have been like to experience that. Same for Donnie. Like you, I probably would have blown off the tornado warning, simply because, well, tornadoes aren’t supposed to happen in that neck of the woods, and the weather reports always seem to be so shock and awe these days it’s hard to know what’s legitimate. It’s a miracle there was not more loss of life and injury. Very happy to see so much volunteer help and support. Mama told me all about what they have done / are doing. Amazing. This is a great article! I go to church with your mom, aunt Rita and uncle Donnie, and your sister. I love your family and Thank God they were not hurt worse. Their neighbors Amy , Daniel, and Sarah Poole are my closest Friends, considered Family. It is heart-breaking to see them hurting and at the same time overwhelming thankfulness that I can still be with them here on earth! God protected so many people and so much property that should have been destroyed! Praise God for His hand of protection. Thanks for the kind words about my family and thank you for taking the time to read and leave a comment. What happened was very devastating. I’m not witnessing firsthand like you all, of course, but it’s just otherworldly almost. Amazing the painter survived in that house, and correct me if I’m wrong, but her son was there too. Is that right? I can’t even imagine what Donnie went through being across the road even though their home didn’t get the brunt of the damage.